Second person that I've seen with this issue. Hard to say since I have so little data to work with and I am having trouble finding ways to replicate it as are a few other people I've asked. Is your Windows laptop a touch screen laptop? That might be the issue. My laptop is also Windows touch screen. It looks like default theme is identifying it as a mobile device because you get same interface as mobile but with larger width. As I mentioned before, classic theme works. Thank you! That definitely reveals the issue. Going to discuss this with the rest of the team to see how we want to tackle this. 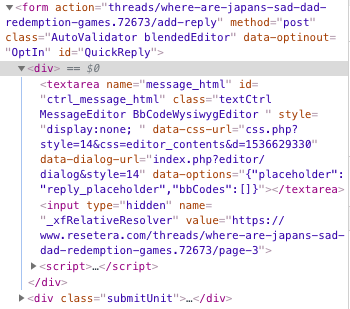 Not quite a bug, but would it be possible for resetera to host bootstrap themselves? Sometimes the third party host takes ages to load. Why do the thread titles vary in size . It's making my eyes go weird. Day/Night? Unread threads are bolded while read threads aren't. This is to make it more clear what have new replies. Problem when on mobile (NightEra, iPhone 6, Google Chrome, phone firmware and browser fully updated). This occurred even before 1.5, but often when I click a link that takes me away from Era, then reopen the Era tab, the page force scrolls up to the top. I have image thumbnails turned off since I sometimes browse at work and clicking image links are the most frequent culprits. It also happens when navigating away from the Era tab on my own. It could very well be a strange quirk of the iPhone 6 I suppose, but it is frustrating to have to quickly scroll back down to the post I was viewing when it happens. I can get it back if I use incognito mode or Firefox, but Chrome refuses to display it for some reason. I've tried disabling all extensions and deleting all restera's cookies but still no dice. I'll see about getting others to test this as it doesn't cause an issue for me at all. 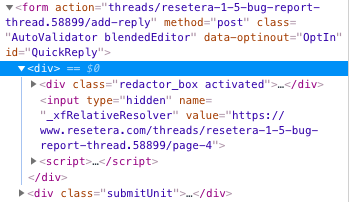 Looks very much like you blocked the entire .redactor_box part. What extensions do you use? Some kind of blocker? Make sure to check your custom filter rules. I'm having issues where embedded tweets aren't loading. I've heard this is a widespread issue that may not be ERA-specific, but this is the only place I've seen it happening. It should be a conflict with your specific content blocker + browser. Go to your content blockers filters and delete everything that mentions a tweet for now to resolve the issue or wait for an update to fix it automatically and/or use a different browser + content blocker that won't have this issue. Let me know if you don't use any content blocker. I did have something regarding tweets in my uBlock Origin file which I added the last time this problem happened earlier this year. I deleted that line but the problem is still happening. Like some members said earlier, it seems there is a problem with embed tweets, sometimes they load and sometimes they don't even load. But if I refresh the page many times when tweets don't load, they might finally load and appear. So, I think the problem with the tweets that don't load is related to the ads that we get in that page, sometimes the tweets load and sometimes tweets don't load because of the ads that we get are changing. The embedded tweets issue is related to Twitter and certain adblock lists. You may have a social media blocklist causing it. I don't even use adblock. I don't have a social media blocklist and tweets load fine elsewhere on the internet. FYI it wasn't an extension (I disabled all of them and it still wouldn't appear). I fixed it by completely wiping my browser data, which might point towards a GDPR privacy cookie.. Going to try testing a fix right now and see if it works and doesn't cause other potential issues. If it works well, we'll implement it here. I often make posts with a lot of links and formatting, but I find that when I get around to posting, a lot of this formatting is removed. However, I can then back into my post-writing page, copy the formatted text, and then paste it into an edit for the post, and the formatting appears fine when I complete the edit. This shows that the formatting is removed when actually posting. I have Era white listed and everything but tweets just stopped working in the past week or so. It seems that I stopped having problems with those tweets not loading. I have to say that I have changed absolutely nothing on my side, so I really don't know if ResetEra has done something to fix it. I don't know if this is the right place to put this, but I currently am unable to browse the site on mobile because of this ad. It pops up 100% of the time on both forums, and just started today. Using Chrome on a Galaxy Note8. Edit: Posted in Ad Reporting thread. Sorry for posting in the wrong spot. Is it a bug or did I change a setting somehow? I opted in to hide avatars in my preferences but I still see them, is that a bug or a feature? Multi-quote doesn't seem to be working for me. I can select the '+' and it's highlighted, but there is no option to 'insert quotes' when posting. You appear to have selected the option that enable it on a device by device basis instead one that applies it to every device you are logged in on. That's the default so it is understandable. Either name the device that you want to disable avatars/images on or select the option to enable it everywhere. Is it only on DarkEra, LightEra, or both of them? I'm assuming that it works in other browsers on your phone? Have you tried clearing your cache? Worked out its only on private mode where the issue occurs; and yeah it's the same on Dark/Light. Not sure if it qualifies as a bug you really need to get rid of the navigation buttons on the reply screen. They sit directly above the keyboard candidates and the amount of times I've gone to pick a word but accidently hit one of the forum shortcuts is getting ridiculous. Seriously, there is no reason for them to be there on the reply screen. This is definitely a bug, when zooming the navigation bars balloon to ludicrous sizes. I honestly wish I could turn them off completely.. Android Firefox. Hmm. It should disappear in most cases. I know that on iPhone Safari I generally have to scroll up while the keyboard is active for the menu bar to be be hidden. It is automatically hidden in iPhone Chrome. Is that the stock Android keyboard? I'll try to test it on Android sometime tomorrow. Given that Xenforo isn't really designed for zooming in on webpages on mobile (there were/are some pretty annoying glitches) I don't actually recommend zooming on mobile. Generally all text should be readable enough that there shouldn't be a reason for one to zoom. And fixed/floating items are going to blowup when one zooms. See the floating bar in Xenforo's community forum (running on Xenforo 2) as an example. Sad panda. Yeah mostly it's fine but every now and then I'll want to zoom in on an avatar or a youtube thumbnail without clicking in. No plans to add an option to remove the navigation bars? I guess that would be ideal..
Ugh. We’ve had a number of issues with Swiftkey though I can’t recall if this was one of them. No plans for that option at this point nor do I see them being made especially with the 2.0 update public reveal being right around the corner. Any time others and I can devote is better utilized on other tasks. This has probably been commented on already multiple times but I still can't list my xbox gamertag in my profile. Says it does not meet the right format. People would always ask me on xbox live how I got my username since it was spaced regularly or something so I'm thinking maybe at some point you weren't allowed spaces in gamertags? So maybe that could be the issue. I've got really no idea though. I'm on a Windows 10 PC and I've probably tried using every major browser at some point or another. Gamertag is "If You Must" BTW. Anyways, Thanks for keeping up with this forum. The QOL features here on desktop and mobile are better than anything else I've used. I’m not getting notifications when I get quoted in a thread. It started happening yesterday. Anyone else? I’m using Safari on iPhone if that matters. Is this thread to post general suggestions other than bug fixes? In any case, a couple quick thoughts from me on game OTs. I don't think they're very useful for the major releases like RDR2. The threads just move too fast for any serious discussions to develop and flourish. Most people, myself included, are just popping in to casually chat about our last session, something unique that just happened, share screen shots, ask quick questions and other admittedly low-depth, non-discussion starting posts. That makes it near impossible for any in-depth discussion on specific game mechanics, specific plot threads etc. to occur (though I guess the latter can go in the spoiler thread). Any longer, more serious posts may get a few quotes and discussion, but rarely more than that as it's quickly a few pages back in the thread and forgotten as few people look at more than the most recent page of replies. Thus people start threads about more in-depth criticisms of the game or other issues that may generate real discussion, and most get closed quickly with instructions to just discuss it in the OT. Where 9/10 times it will be quickly buried by the flood of casual posts. I know that's unlikely to change as the Review Thread/OT Thread/Spoiler Thread system has been the norm for ages from GAF to here, but I really think it doesn't work well for these huge releases and is part of why Reddit has risen so much while traditional forums have declined in traffic--with game-specific subs discussion flourishes much better than forums and their trend toward catch all threads. I have two ideas I think would work better in terms of promoting quality discussion. I don't expect them to happen, or to get any response, just throwing them out there. 1. Temp sub-forum for 2-4 weeks around big releases. That would allow lots of discussion across threads, without cluttering the forum for those who don't care about that game. 2. Add a 4th thread (to the OT/Review/Spoiler set up) by essentially splitting the OT into a) A general chat thread for posting quick thoughts, asking questions, sharing screen shots and videos and memes etc. (i.e. the vast majority of posts in OTs for big games now) and b) a critical discussion thread for more in-depth discussion of game mechanics, etc. Maybe that could just be some form of user reviews type thread I suppose, but I'd hesitate to put that in the thread title as it shouldn't suggest that its only for posting full reviews vs. being open for any more in-depth criticisms or discussion points beyond the casual "share my quick thoughts as I play" posts that dominate the OT. Anyway, just my two cents as it's a little disappointing to see threads that could generate good discussion on a hot new release get closed when the OTs are full of such low quality, quick take type posts, questions people could google and answer to that have been asked and answered a bunch of times earlier in the thread and so on. I still very much would like to see a feature that autolinks Watched Threads and subsequent OT's. Say I'm following the RDR2 OT and the OT2 is made. Make me follow that thread automatically when it's made, instead of me having to do it manually. I keep forgetting and losing threads, because I miss the fact that a new thread was made. Check alert preferences to see if it is enabled. Also consider that someone may have edited their post to quote you. All the sudden whenever a page loads I get a random rectangle that appears in the lower left corner of my screen that disappears quickly. It goes away too fast for me to even screenshot it. Hmm, what browser does it occur in? Does it occur in more than one? Does it occur in more than one forum theme? And are you currently in the EU? I noticed the same box in the corner earlier. I was using Chrome with DarkERA (not in EU). Orb Was this it for you? This afternoon the formatting of threads in DarkERA completely broke so I switched to NightEra and now I can't view or click on embedded Tweets. My Adblock is currently disabled on this site, but I even disabled it entirely and no dice. That is also the only extension I have on this browser on this machine. I just checked things on FireFox and both DarkERA formatting and Tweet embedding are working fine. The box thing is still happening with DarkERA. Not sure what about Chrome is messing things up. This is exactly it. I use NightEra on Firefox. Not in the EU. It doesn't really negatively affect my experience, I just thought it would be something that people might want to know about.